Very few people think of a flashlight as a self-defense tool. 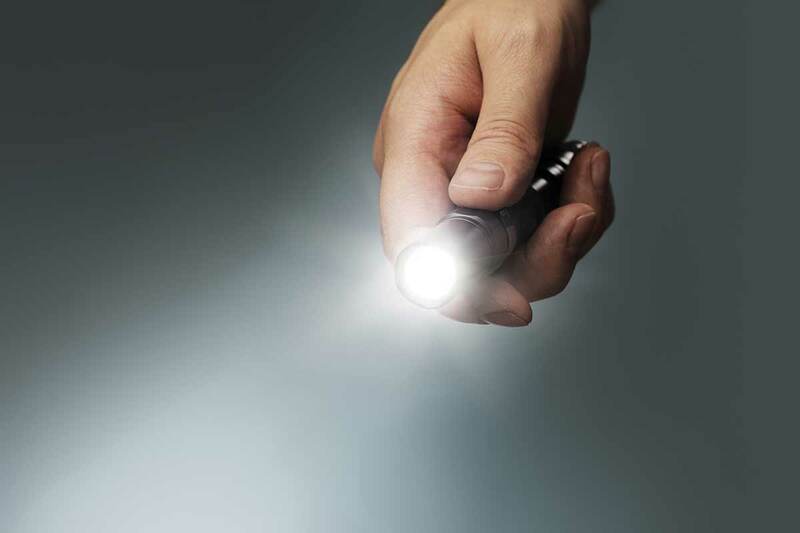 In reality a quality, high-output flashlight is a powerful personal protection tool. Taking away an assailant’s reaction time allows you an avenue of escape. Self-defense flashlights allow you to temporarily blind and disorient an attacker and gain control of the situation. The blinding light allows you to discreetly draw weapons, orient your body and keep your hands out of the sight of an attacker. Flashlight are powerful impact weapons and can be used to deliver devastating strikes. Inexpensive: A good, high-quality tactical flashlight does not have to be expensive. For daily carry, expect to pay $15 to $50 for a high quality light that will meet all of the criteria for a for self-defense flashlight. Easy to Carry Discreetly: A with any self-defensive tool, the ability easily have it with you in a discreet manner is important. Flashlights are “accepted” by society and no one will questions why you have one. However, if your light of choice is cumbersome, you will not have it with you when you need it. No Restrictions: Unlike pepper spray, firearms, knives and other self-defense tools, flashlights are rarely, if ever restricted. Flashlights are allowed on airplanes and can be acquired at any destination worldwide. Disorient: We’ve all had a bright light shined in our eyes that causes us to involuntarily squint and turn away. Disorienting an assailant will open up the opportunity for an escape and/or counter-attack. Illuminates Threat Areas: We can’t predict the situations we will face. A nice evening on the town can end in a dark parking lot with your car parked next to a suspicious vehicle. Tactical lights give you the ability to illuminate threat areas from a safe distance. Impact Weapon/Force Multiplier: A tactical flashlight should be well made and easily fit in the palm of your hand. The flashlight can be used as an “impact weapon” to strike a variety of targets ranging from the face all the way to the hands to break a strong grip. Provides Tactical Advantage: Taking away an assailant’s reaction time gives you the upper hand. If you are going to run from an attacker, you want to run in a direction that is least suspected. Quickly blinding an attacker with a light opens up avenues of escape. Flashlights are also “force multipliers.” Flashlight can be used as impact weapons. Certain flashlights have crenulated strike bezels on the front that designed specifically for use as impact weapons. Ease of Carry and Concealment: A flashlight is going to be a balance between function and size. Purchase a light that is small enough to have with you at all times. Minimum of 100 Lumens of Output: If a light is to be used for blinding an attacker, the more lumens the better. Momentary On/Off Switch: A tactical light for self-defense should have a momentary on/off switch that is easily actuated with one hand. LED Bulb: LED bulbs are extremely rugged, bright and long lasting. Waterproof/Rugged Housing: At a minimum, a light for self-defense should be water resistant to withstand rain and foul weather. Long Battery Life: The light needs to work. Use extended batteries with a long shelf-life. Crenulated Strike Bezel: Strike bezels on a flashlight can inflict pain on an attacker. Crenulated strike bezels have serrations around them that are sharp and can easily cut into an assailant. If you plan on carrying the flashlight in your pocket the bezel can cut your pants and dig into your leg. Flashlights are made with removal strike bezels. Hopefully you now look a flashlights in a new light. A tactical flashlight is an serious self-defense and safety tool that should be with you at all times.